The Bodhisattva, literally “enlightened being,” is a figure from the later, Mahayana Buddhist tradition who we might call “the one who comes back.” In early Buddhism, the ideal to which people strove was the “arhat,” the monk who flees the messy, quotidian world of everyday life–of family, business, politics, and so on. The world of time is seen as a prison, a trap, a source of endless suffering, and enlightenment is conceived of as escape (“nirvana”) from this vicious cycle (“samsara”). Here we see a strict separation between monks and laity, the monastery and the marketplace, eternity and time, the spiritual and the material, nirvana and samsara. In later Buddhism, however, a different idea emerged. This is portrayed in a story about four men. Their town beset by draught and famine, they set out into the desert in hopes of finding succor. After a few days, they come upon a high wall. The first man scales the wall, and upon seeing a lush, edenic scene, rejoices and leaps over the wall. The next two men follow suit. But the fourth man pauses atop the wall, turns back toward the desert, thinks about all the people suffering in his town, and vows not to enter into paradise until the grass itself is enlightened. The Bodhisattva operates according to a nondual logic:. Eternity is in time, wisdom is compassion, the other world is this world properly seen, and, as a Japanese philosopher quipped, if you can’t find nirvana in rush hour traffic on a Friday afternoon, you’re not going to find it anywhere. The Bodhisattva is the Christ-like figure, the bringer of light, the one who works tirelessly to alleviate the suffering of others. In contrast, the arhat, the still, stone Buddha on the mountaintop who pursues enlightenment for himself, might be seen as an escapist who writes the world off (this is a crude simplification of Buddhist categories used to illustrate a point); in other words, he might be seen as a sell out. We tend to be dualists with our spirituality. Business and economics are “materialistic” and “mundane,” while education and religion are seen as “humanistic and “spiritual.” But the lesson of the Bodhisattva is that things are not always what they seem: the man in the business suit crunching numbers or writing code at a hedge fund may be more enlightened and doing more good than the yogi doing sun salutations on an island retreat. For the Bodhisattva, the bottom line is action that, to quote Steve Jobs, makes “a dent in the universe,” not spiritual airs. Spirituality doesn’t matter if it doesn’t move the material world. Intellectuals and people who sort of shrug when asked if they are liberal will reflexively dismiss this as just more ideology: “Ooooh, look, now the system is getting so good at masking its exploitation and injustice that it’s making it look like people will make oodles of money just so they can give it away (and make those very people think that they are ‘gaming’ the system by leveraging its perverse architecture for good), but it’s really just the latest subtle and insidious and serpentine twist, another skin that the serpent of capitalism will slough off in its eternal quest to screw over most of the people to benefit a few of the people, even though those people won’t really benefit because the system-serpent is really eating its own tail.” And so far forth. That explanation could be true. But so could a simpler one: Capitalism has tremendous psychological, social, and environmental collateral damage, but it’s the most workable system given the constrains of reality and human nature, and if some smart people are finding ways to redistribute that wealth and living simpler, low impact lives in the process, then that’s a pretty damn good thing. 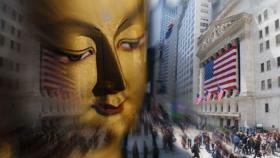 To mash it up with the first Noble Truth of Buddhism, “Capitalism is suffering.” And just as governments have found ways to intervene in the marketplace in order to mitigate its creative destruction, so conscientious persons can enter into the stream of commerce to surf and channel its power for maximum human benefit. This can be seen as part of the great struggle to “turn the aircraft carrier” of late capitalism, as we see with the rise of Corporate Social Responsibility, Green Capitalism, and Philanthro-Capitalism. It’s time for humanists, intellectuals, and spiritualish folks to make up with capitalism, and rather than rage against the machine, find ways to work within the system to catalyze meaningful change. The problem is that these neo-capitalist do-gooders are merely reinforcing the dominant and unsustainable economic frame that is contributing to the erosion of the middle class. It’s great that they are redistributing wealth to people in the developing world, but there can only be so many MIT whiz-kids, and only so many who won’t be “Zuckered” into the data mine to go for the gold. When it comes to new forms of charity and philanthropy, this is a stellar development; but when it comes to breaking the back of the New Feudalism, which enables and reinforces our de facto plutocracy, it doesn’t really make a dent in our macro-economic plight. A very compelling post! I am just trying to make up my mind on Nassim Taleb’s most recent book Antifragility, and I am delighted to stumble upon posts such as yours or Dan’s most recent post on capitalism. I agree with you, in particular with the last paragraph. I had once thought you need to “make it to the top within the system” in order to change it or to criticize it (and probably become such a modern Robin Hood). This holds for both academia and global corporations. In particular since corporations turned all green and social I have the same issues with both. I equate so-called corporate responsibility with academia’s alleged lofty goals – both in stark contrast to bean-counting systems built on performance reviews or your academic track record. As long as companies were downright greedy I had less issues with them. I have never understood how those “social projects” somewhere in the world – far away from your workplace – would compensate for that “competitive” culture created in the headquarter. I would rather advocate trying to make changes in your immediate environment – which is tougher, more tedious and less glorious, than just working hard, following the rules, and dumping a donation somewhere. But aiming at changes in the part of the economy you can control (a bit) requires you to take personal risks – you need to put your job on the line every day. I like Taleb’s notion of the necessity to have skin in the game. The do-gooders you describe do definitely not have skin in the game – rather the opposite: They seem to combine success as a result of following the rules with humanitarian goals – such strategies are exactly what I had in mind when writing about ‘hacking the game’ in recent posts and comments. love this article. thanks so much for taking the time to reflect and share this.